Hey, that tastes good! : Chex! Chex! Chex! Chex mix. Chex! Chex! Chex! Chex mix. Chex chex chex. I ate a lot of Chex as a kid, and even more Chex mix as a college kid. Up until very recently, Chex were off limits. Now they’re not! Hooray! All they had to do was replace the barley malt with molasses, and viola! Gluten free Chex! When I was in Florida with Dana, we went to about 20 grocery stores. In each one we would look for gluten-free things we don’t have at home, and cruise the cereal aisle for the new GF Chex. No luck. But yesterday I went to the Superfresh (grocery store) nearby and they had them! So I bought two boxes. One for me and one for Dana, who is coming over for Passover. Since I’m not much of a cereal eater, I made most of my box into two flavors of Chex mix, since that’s what I miss the most. I scaled down the recipes because I’m not feeding 50 people. Thanks, General Mills! Mix the first 7 ingredients together. Put the Chex and pretzels and nuts, if using, in a bowl, toss with the butter mixture. Spread on a pan and bake at 250 for 45 minutes, stirring every 15. Let cool, try not to eat all at once. Combine the brown sugar, butter and corn syrup in a saucepan on the stove. Heat until melted, then bring to a boil and cook 1 minute. Pour over Chex, toss to coat, and spread out on a baking sheet. Bake at 250 degrees for 45 minutes, stirring ever 15. Cool 5 minutes, stir in chocolate, then finish cooling. Chex is gluten free now?!?! I love that stuff! This makes my day. Oh, I can't wait to actually try the gluten-free chex mix recipes now that the cereal is available at my grocery store. Thanks for the preview! ps - would you mind adding my URL to your Blogroll? OH delicious! these were SO GOOD! by the way, I hope everyone is careful to make sure they buy the gluten-free rice chex and not the old gluteny ones! you'll always be my gluten free goddess. I'm so sad...I haven't been able to find the GF Rice Chex yet. Thanks for posting your recipe...I'll have to try it out when I can find the cereal. jacobi - yes! But, be careful, only the NEW ones are gf. It says it right on the box though, so you don't have to read all the ingredients! I found them at Target the other day. Catherine- It's very exciting to be able to make something I loved as a kid again. Site added! sheltie girl - You'll find them! 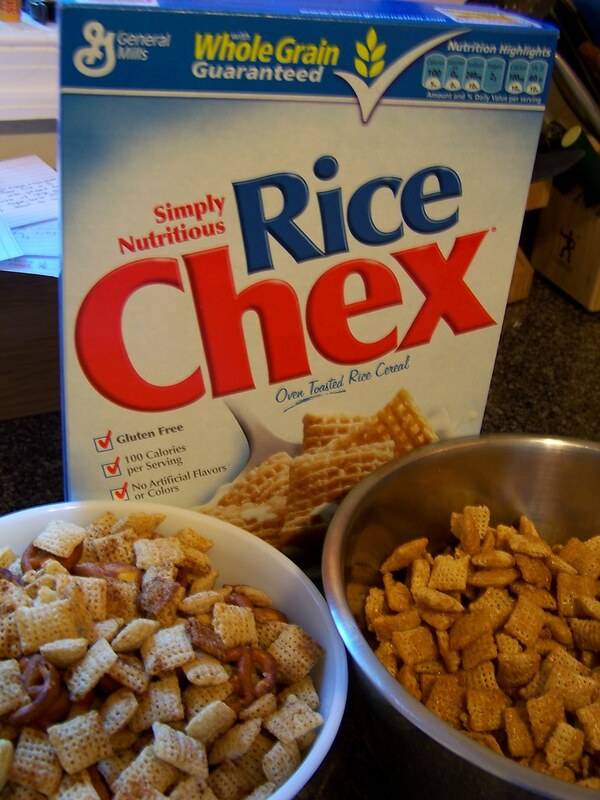 The old ones are being phased out so someday ALL rice chex will be gf!! We can't get the GF Rice Chex in Canada (no idea why), but my brother drives truck in the US, so his last trip he found them and brought me 6 boxes. :) Only 5 to go now...Hard to believe you can get a GF cereal in the regular store for less than $2/box! AMAZING!